﻿ Sevilla 3-3 Real Madrid. The Merengues go 40 games unbeaten! 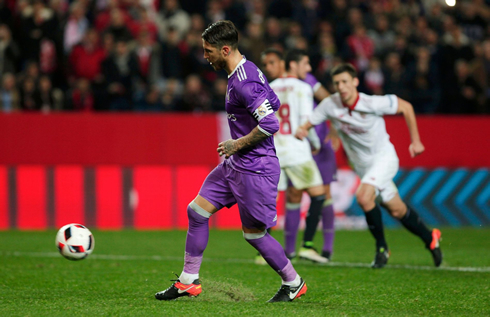 12.01.2017 » Sevilla 3-3 Real Madrid. The Merengues go 40 games unbeaten! 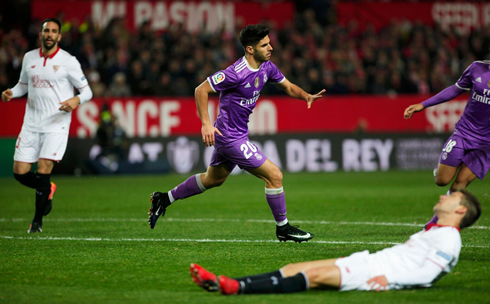 After a 3-0 home win last week, Real Madrid travelled to the Andalusian region to face Sevilla for the 2nd leg of the Copa del Rey last-16 round and they completed their task by leaving the pitch with a 3-3 draw. 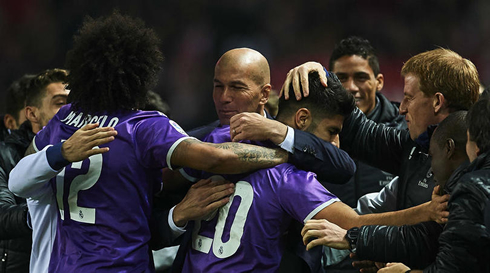 Zidane's men are now unbeaten for 40 games in a row and just set a new record in Spanish football. Real Madrid have just broken a new record in Spain, after coming out of the Sanchez Pizjuán undefeated and extending their unbeaten streak to 40 games. Tonight, the Merengues didn't get the win they were looking for, but given the circumstances, the 3-3 draw against Sevilla ended up being a more than welcome reward. Zinedine Zidane's men are now through to the quarter-finals of the Copa del Rey thanks to an aggregate score of 6-3. Next Sunday, Madrid repeats their visit to Sevilla in a league game. It may not have been the best possible lineup from Madrid, but the same can be said about the starting eleven Sampaoli picked for his side tonight. The 3-0 from the 1st leg obviously had much to do with that and the truth is both teams piroritized their upcoming clash for La Liga, scheduled for next Sunday evening in the exact same stage. The game tonight was dominated by Sevilla in most of its periods, but for one reason or another, the home side struggled to convert their chances. Ironically, it ended up being Danilo, a Real Madrid player, scoring the opener in his own net, early in the first half. However and fortunately for the Merengues, Sampaoli's men were not very sharp in front of goal for the rest of the half and the score remained at a 1-goal lead until the break. Zidane knew the danger a tie like this could present if his men were to fail to find the back of the net, but soon after the game resumed for the second half, Asensio incarnated his absent teammate Cristiano Ronaldo and scored a splendid solo-run goal. The Spaniard sprinted roughly 70 meters before leveling things off and inflicting a massive blow in Sevilla's hopes. The best was definitely saved for the second half as Sevilla still found strengths to fight back and put themselves on the driving seat once again, thanks to a goal from Jovetic in the 53rd minute. The hosts would still see their hopes sparked in the 77th minute, when Iborra made it 3-1 to the Andalusian side and again, just 2 goals away from turning around the tie. However, it just wasn't meant to be... Real Madrid reacted well to the pressure and miraculously found a way to avoid the loss with a couple of goals in the last minutes of the game. 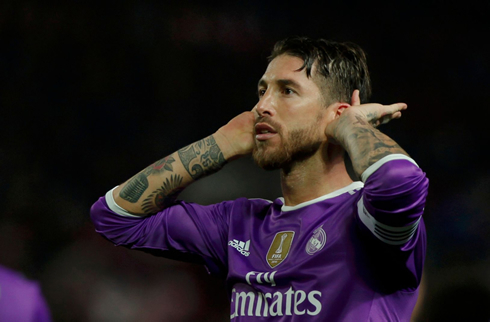 They first cut back the lead to 1 goal thanks to "panenka" penalty-kick converted by Sergio Ramos, just before the final upset was delivered by Karim Benzema in the 93rd minute, in a terrific play between Marcelo and the Frenchman. Real Madrid are now 40 games unbeaten and broke the previous 39-game record set by their archrivals Barcelona in 2016. Cristiano Ronaldo next game is a La Liga fixture, on January 15 of 2017 against Sevilla. You can watch Juventus live stream, Sevilla vs Real Madrid, Barcelona vs Las Palmas, Leicester City vs Chelsea, Swansea City vs Arsenal, and Tottenham vs WBA, all matches provided from our football live game pages.